Indoor activities. We desperately needed indoor activities on our second day in Milwaukee. Our afternoon at the Milwaukee County Zoo was pushing it when it comes to heat tolerance. Day 2 could not be spent outside. 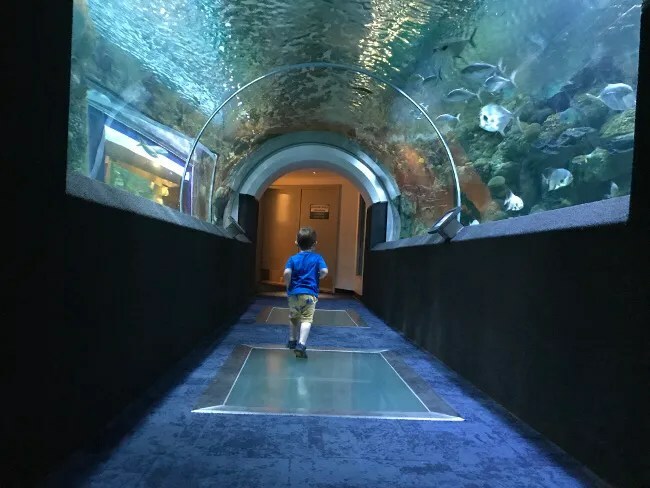 I just started searching “Things to do with Kids in Milwaukee” and got a few good ideas. The one that looked the coolest was a Science and Technology Museum near the lake downtown. 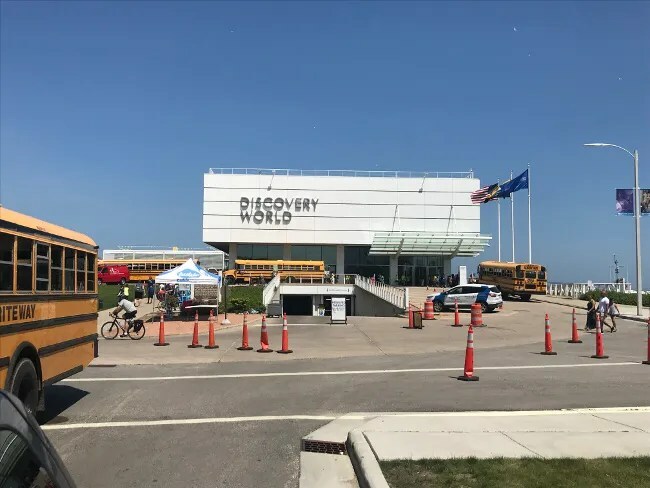 Discovery World is on Harbor Drive near where Michigan Street runs in to the lake. The area is under some construction right now and, just like the issues we had parking downtown, Summer Fest is going on at night so that basically means the city shuts down during the day too. It was really hard to figure out where to park. There was no signage and there were cones already set up to direct traffic for the concerts that were still six hours away. I went around a couple of cones and it was then that I saw the garage underneath the building at Clybourne Street. There was, of course, a sign for festival parking at the entrance to the garage, but I pulled a ticket anyway. As I went through, the guy taking money asked if I was there for the festival or the museum. I said museum and he waved me through. The entrance most people will use is from the parking garage underground. There are signs pointing you back to the elevator. 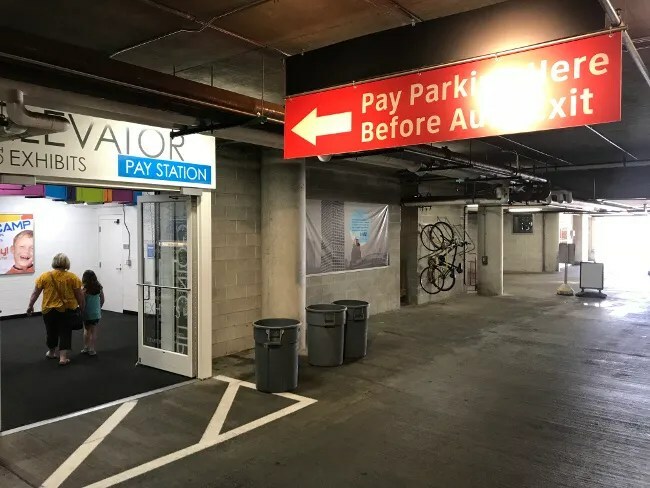 This is also where you pay for parking, but the credit card reader was broke so we had to make sure we had cash. A short ride up the elevator brings you to a long glass hallway. 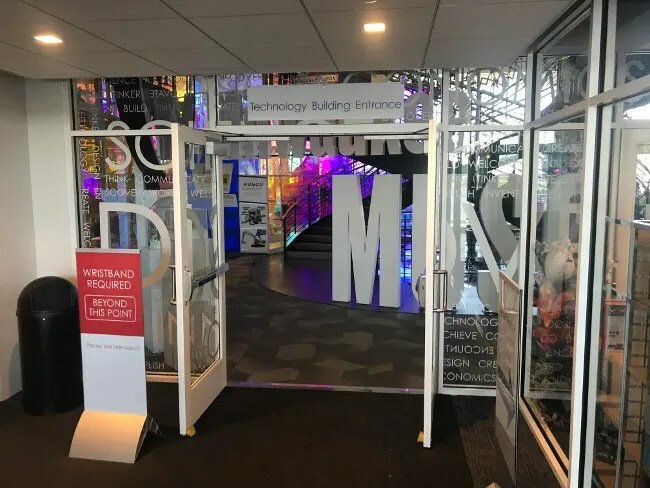 There’s a door leading to the Technology Building right as you walk in but the admission desk is around the corner. Admission is $19 for adults and $16 for kids 3-17. Fortunately, B is still 2 so he is free for a few more months. It still cost us just under $60 for the three of us. We were given wristbands to show that we had paid then we were free to explore on our own. We headed towards the Aquarium first. There are three floors of exhibits on this side of the building. The first thing you see is the Great Lakes Future. 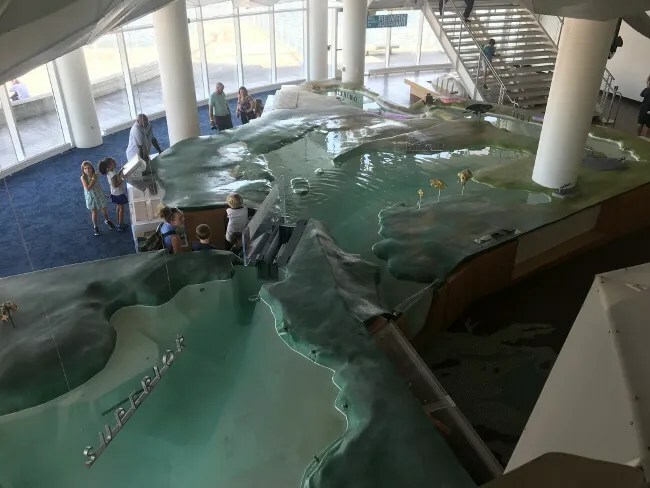 It’s a huge, 3-D map of all the Great Lakes that you can interact with. We didn’t see how but you can apparently make it rain. J was sitting near the exhibit while the kids and I went up to the Skybridge to look down. We somehow missed the rain show. 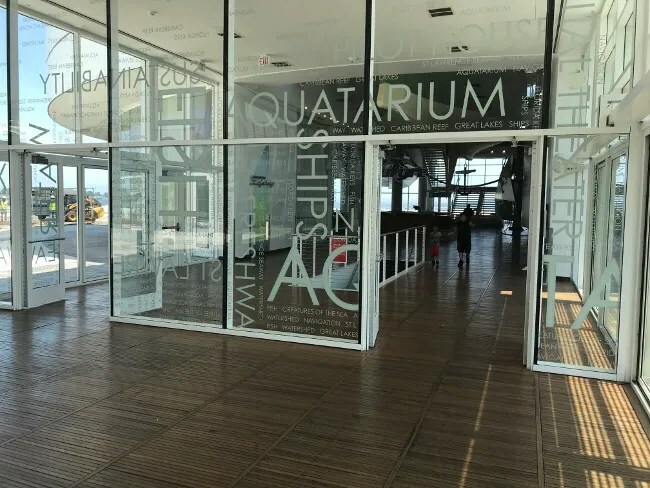 The second floor of the aquarium is the Pilot House. 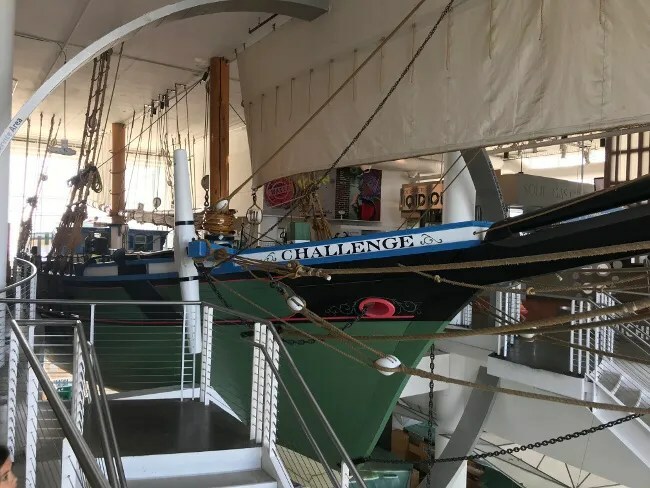 There’s a replica of a Great Lakes Schooner from the mid to late 19th century called the Challenge. 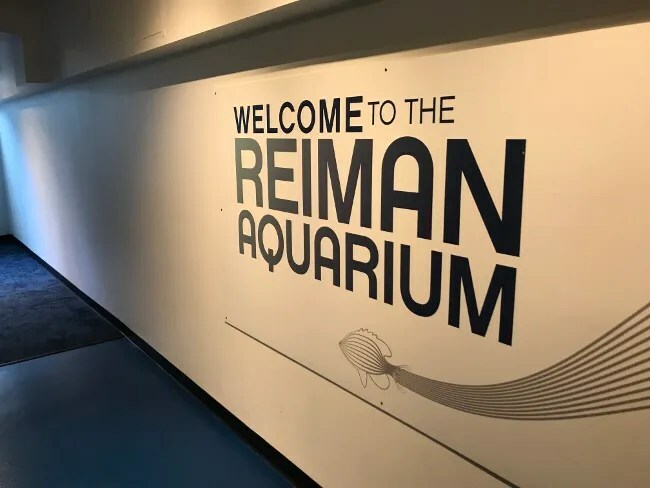 The cool part of the Aquarium side was in the basement were the Reiman Aquarium is. 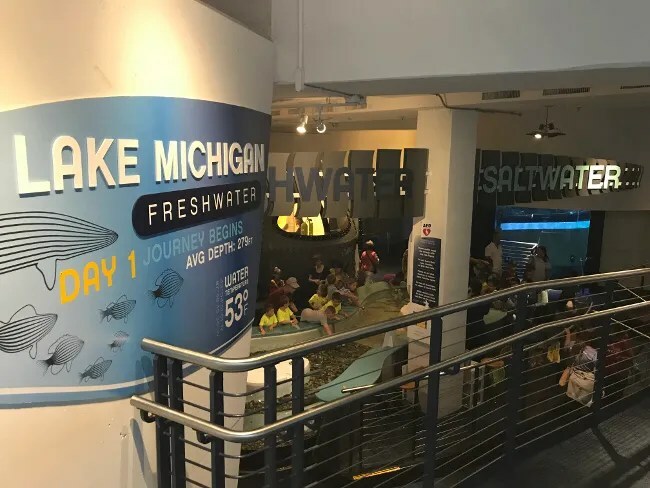 There are huge tanks spread throughout the space with both freshwater and salt water fish including a huge variety of species that can be found in Lake Michigan and other Wisconsin waterways. There is a giant tank as you come down the elevator. 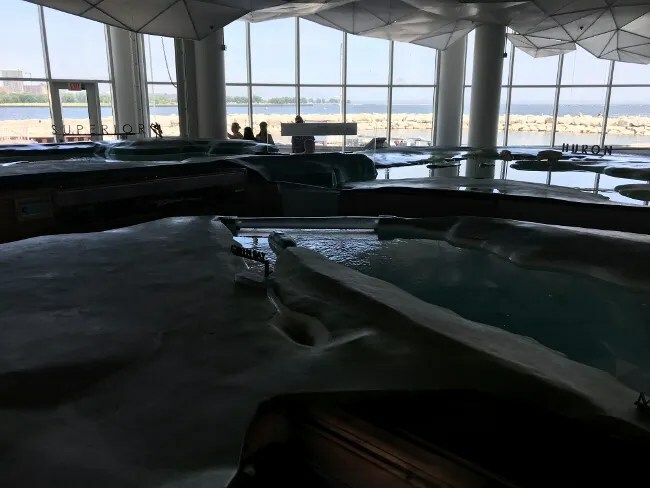 From the other side you can see a floor to ceiling fresh water tank of species found in the Great Lakes. On the other side of the room is the Caribbean Tunnel which you walk through. 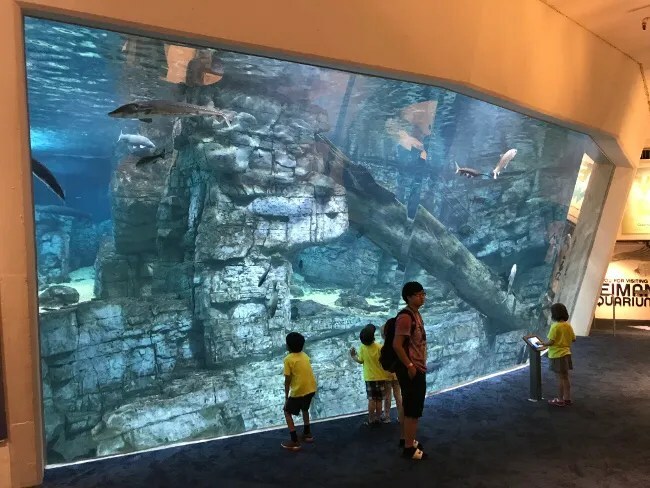 The fish swim up and over giving you a view from below as they swim freely in the tank. The popular attraction in this area was the touch tank. 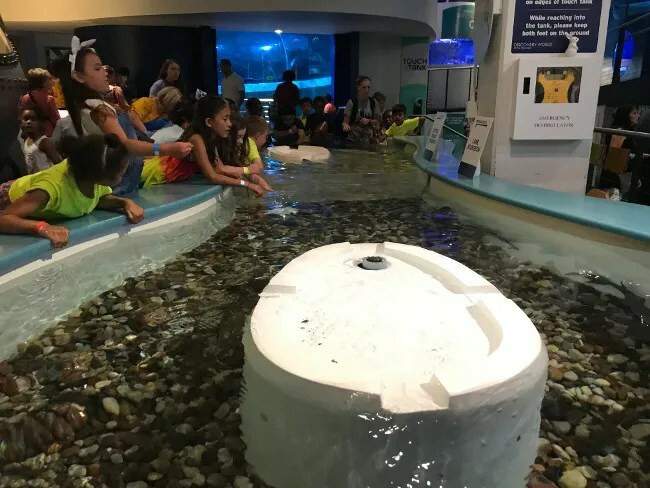 There were sting rays that would float towards the top close to the kids and there was another tank of fish (sorry, I forgot what kind) but they tended to stay away. We spent most of our time here, but it was crowded…as was the whole museum. There were several summer camp groups at the museum that day and you know how kids can get. There aren’t enough chaperones and the kids just kind of run free. I pulled both of my kids out of the way more than once so they didn’t get trampled by a gaggle of kids running from one thing to the next. We walked back down the hall towards the Technology part of the building after the kids had their fill of fish. 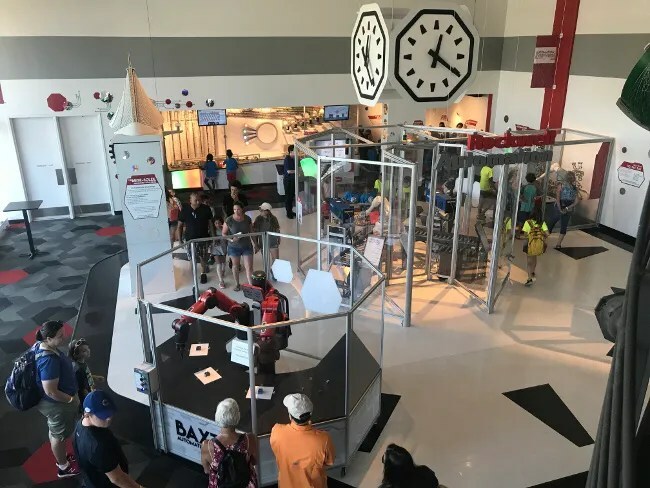 This area is more stem focused with the how and why of machines. The first area is Automation Everywhere. Again, there were a lot of kids running around so we didn’t really get a chance to explore much. Right inside the door there’s a sorting game that you can play against the computer called the Dream Machine. We couldn’t really tell what was going on because we kept getting pushed out of the way. 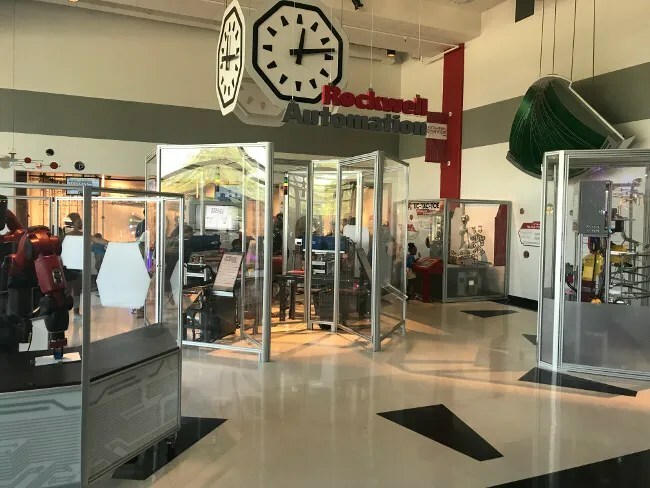 We then walked passed the Milwaukee Muscle section which has different motors and other car components set up so you can see how they work by moving wheels, levers, and switches. That kind of continues in the next area where the Mini-Excavator is. The cool thing about this was that the controls in the cab don’t work. 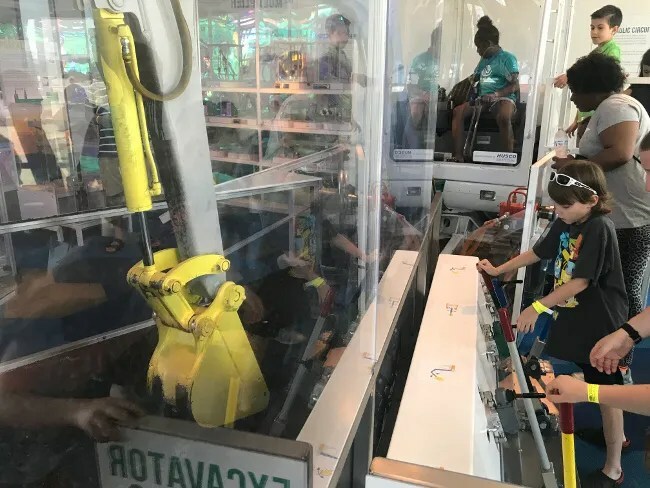 The idea is to work together with others and move levers outside of the boom arm area to make the boom work. The kids all thought the controls were inside, so L and I, along with another dad and his daughter were able to work the controls together to dig a hole. The lower level also has the Music Factory where you can program machines to play songs. We very quickly looked at this area but it was a mess from kids just grabbing and throwing things…we couldn’t do anything productive so we headed upstairs. Upstairs is where we had the meltdown that almost ruined the day. L saw the Kohls Design It! Lab. L really likes art projects and she could see kids in there doing something. We went to pull on the door and we were stopped. The lab is only open to the public on Saturday and Sunday. During the week it’s used for groups which is who we saw in there. L didn’t take the news very well and was kind of out it for the rest of the trip. We didn’t last much longer. I didn’t get her somewhat back on track with Physics and You area. 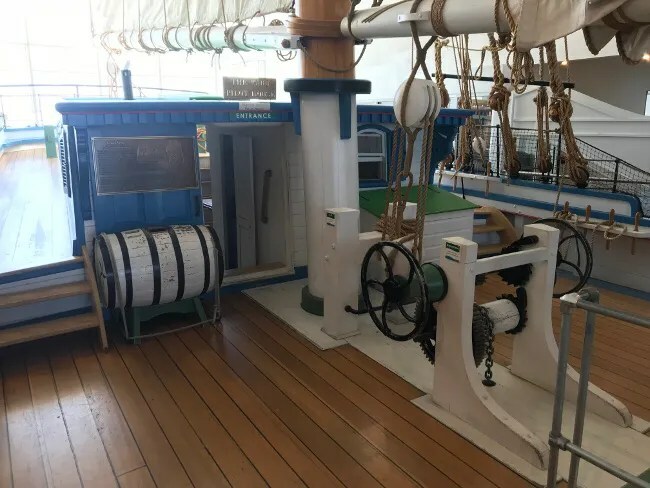 There were a bunch of stations with projects to be completed and tested…but….and you can guess where this is going…every time we sat down to do something we had a group of kids with no supervision breathing down our necks and pushing through. We made rockets but could never try flying them because kids were seeing how high they could shoot water bottles instead. We sort of looked around the rest of the second floor but didn’t do much. There’s a really cool Genone Sculpture inside the spiral staircase. There’s also a virtual reality area and Innovation Planet which explores the work of Warren Johnson of what would become Johnson Controls. The kids were at the end of their ropes but there was one more thing I wanted to see. Les Paul’s House of Sound. 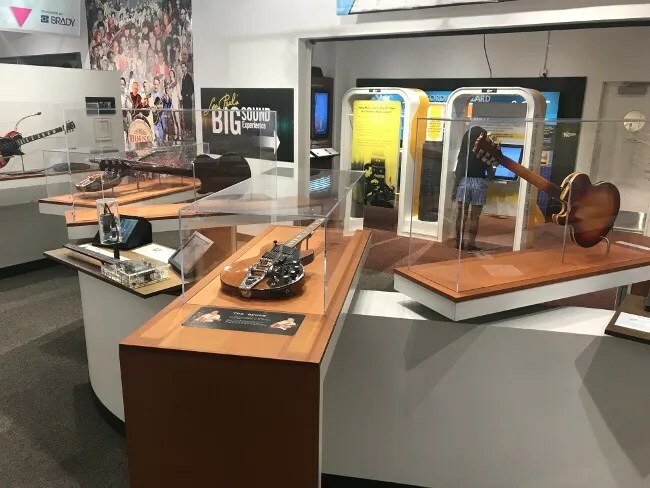 This is a mix of a history lesson and an interactive exhibit exploring sound. 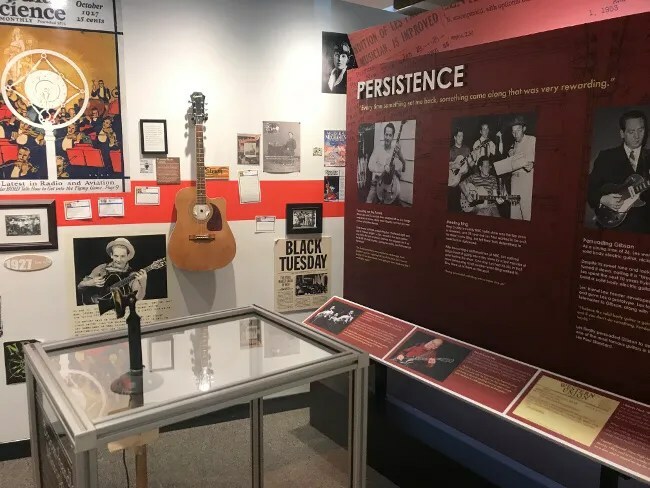 There are a lot of Paul’s guitars on display throughout the large area. There are also stations to create music using different instruments both through technology and the old fashioned way. I could have spent a really long time just in this section but the kids were itching to get back to the hotel to go swimming so I was happy with what time I was able to con my way in to. 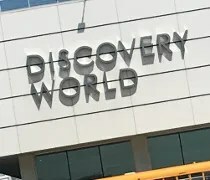 Discovery World is a really cool museum on Milwaukee’s lakefront. Our trip wasn’t the greatest due to factors outside their control. The whole parking situation downtown due to SummerFest had me in a bad mood before we even got there and the large groups of campers that were just running around made it hard to really explore things. Discovery World is probably better on a weekend where there are more parents watching what their kids are doing. 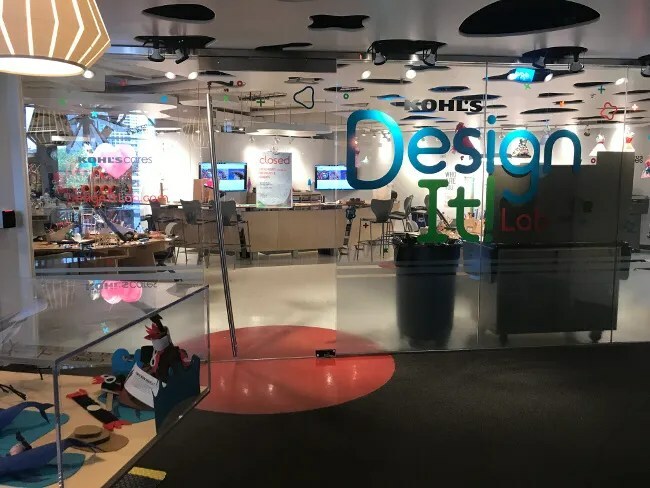 I would have loved to have spent more time with L on some of the experiments but the combination of her being mad about the Design It lab not being open and older kids waiting to push us out of the way didn’t let that happen. 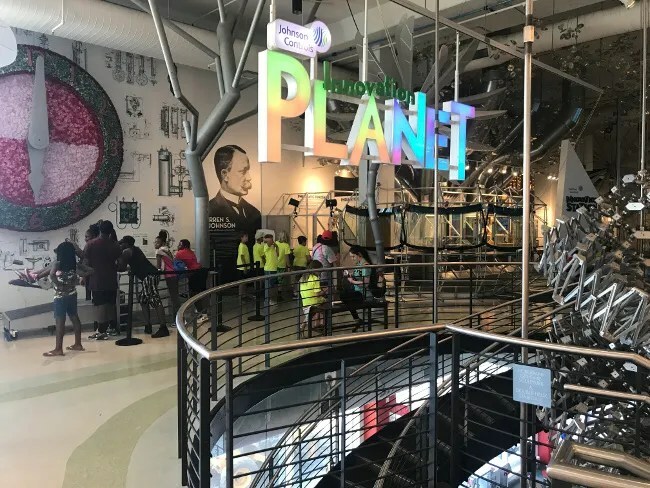 Discovery World is still a place I would recommend, especially if you have older kids. My six year old was probably right on the lower age range of this museum. 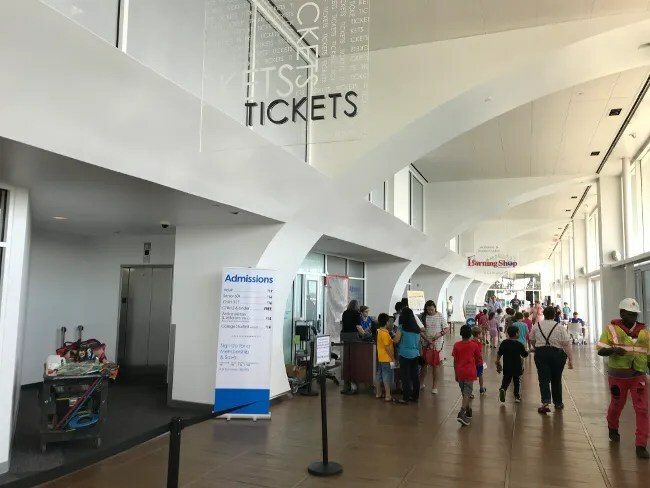 This place is perfect for upper elementary and middle school aged kids and it’s a great indoor activity for those days that it’s raining or just too dang hot outside. Oh my goodness! It looks so interesting there!!! Thanks for sharing!